On the northern corner of West Bengal state of India, there is a hill station – Kalimpong, which once hosted celebrities from all over the world. The hill town, where most of the settlers are of Nepali origin, no longer retains its old charm. But until a few weeks ago the last prime minister of a country – that has lost its independence – used to live here. Kazi Lhendup Dorji, who died on 28 July this year at the ripe old age of 103, had played a pivotal role inn the merger of Sikkim into India. Dorji is seen as a ‘traitor’ in the comtemporary history. He lived, and died, with the same ignominy. “Everybody accuses me of selling the country. Even if it is true, should I alone be blamed?” he asked me, when I met him in Kalimpong in November 1996. But the allegation of ‘betrayal’ towards one’s own motherland was so powerful that Dorji could no more lead an active political life. 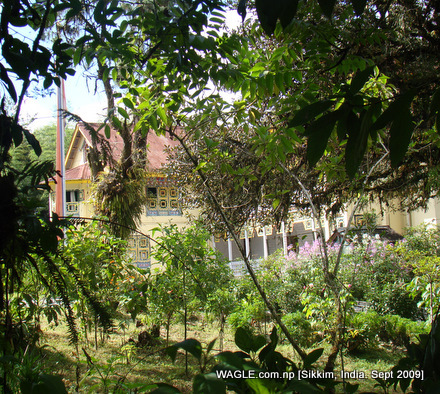 Hew spent his solitary life at the ‘Chakung House’ in Kalimpong for several decades. Few people chose to remember Kazi when he passed away nor took pain to recall his life and times. When I visited Kalimpong for the second time in 2000, Lhendup’s anger towards Delhi had reached new heights. At one time, he was received warmly by Indian leaders including Jawaharlal Nehru and Mrs Indira Gandhi. But later he became a political actor whose utility had been finished and thrown away into the dustbin. After India got independence in 1947, the Sikkim State Congress, which was established as per the advice of Nehru, launched anti-King movement. Sikkim managed to overcome the crisis then but agter Indira Gandhi became Prime Minister of India, the tiny Himalayan Kingdom found itself in a crisis from which it could never escape. The anti-King movement, launched by the Sikkim National Congress (SNC) under the leadership of Lhendup Dorji in 1973, led to the demise of a sovereign nation. India openly supported the movement against King (Chogyal) Palden Thondup Namgyal. The then ADC to the King, Captain Sonam Yongda, claimed that soldiers of Indian Army in civil dress used to take part in the protests. Some of the protesters were from Darjeeling and surrounding areas. The number of Sikkimese who took part in the protest was quite small. But that was enough. Lhendup’s protest movement depended mainly on Indian financial assistance. The money was made available through Intelligence Bureau (IB). “The people from IB used to visit me twice or thrice a year. An IB agent, Tejpal Sen, used to handover money to me personally,” Dorje had told me in a recorded interview. In fact, the main actor behind the “Mission Sikkim” was India’s external intelligence agency, RAW (Research and Analysis Wing). Set up in 1968, RAW was able to disintegrate Pakistan (and form Bangladesh) within three years. The annexation of Sikkim was their other ‘historic’ success. The strategies of RAW didn’t want to repeat a Bhutan in Sikkim. Bhutan managed to acquire the membership of the United Nations in 1968. So, they launched a movement under the leadership of Lhendup, which is described at great length by Ashok Raina in his book inside. Lhendup- who belonged to the Kazi family- had a historic enmity with Sikkim’s ruling Chogyals. He said he wanted to pressurize the King through public protest but lamented that the King never came forward for reconciliation. In fact, India was playing a ‘double game.’ On the other hand, it was supporting Lhendup in whatever way possible against the King. On the other hand, it was assuring the king that monarchy would survive in Sikkim. The Chogyal was also an honorary Major General of the Indian Army. He never thought that his ‘own army’ would act against him. It was only an illusion. The Chogyal of Sikkim was in his palace on the morning of 6 April 1975 when the roar of army trucks climbing the steep streets of Gangtok brought him running to the window. There were Indian soldiers everywhere, they had surrounded the palace, and short rapid bursts of machine gun fire could be heard. Basanta Kumar Chhetri, a 19-year old guard at the palace’s main gate, was struck by a bullet and killed-the first casualty of the takeover. The 5,000 strong Indian forces didn’t take more than 30 minutes to subdue the palace guards who numbered only 243. By 12:45 pm it was all over, Sikkim ceased to exist as an independent kingdom. The Chogyal also lost the second opportunity. The Sikkim Guards had the capacity the stop the Indian Army for two hours. If the Chogyal had informed Beijing and Islamabad about the Indian invasion from the transmitter set up at his palace, both the countries had assured him- during the Kathmandu meeting- that they would instruct their security forces to open fire along the borders with India. Chinese army could even travel to Gangtok to rescue the Chogyal. Captured palace guards, hands raised high, were packed into trucks and taken away, singing: “Dela sil, li gi, gang changka chibso” (May my country keep blooming like a flower). “The Chogyal was a great believer in India. He had huge respect for Mahatma Gandhi and Jawaharlal Nehru. Not in his wildest dreams did he think India would gobble up his kingdom,” recalls Captain Sonam Yongda, the Chogyal’s aide-de-camp. Nehru himself had told journalist Kuldip Nayar in 1960: “Taking a small country like Sikim by force would be like shooting a fly with a rifle.” Ironically it wa Nehru’s daughter Indira Gandhi who cited “national interest” to make Sikkim the 22nd state of the Indian union. During a meeting, former Chief Minister of Sikkim BB Gurung told me that the King and Lhendup were just fighting a proxy war. “The real battle was between an American and a Belgian lady.” If that was true, the real victor was the third lady- Indian Prime Minister Indira Gandhi. Chaogyal Palden met the 24-year old New Yorker, Hope Cook, in Darjeeling in 1963 and married her. For Cook, this was a dream come true: to become the queen of an independent kingdom in Shangri-la. She started taking the message of Sikkimese independence to the youth, and the allegations started flying thick and fast that she was a CIA agent. These were the coldest years of the Cold War, and there was a tendency in India to see a “foreign hand” behind everything so it was not unusual for the American queen to be labeled a CIA agent. However, as Hope Cook’s relations with Delhi deteriorated, so did here marriage with Chogyal. In 1973, she took her two children and went back to New York. She hasn’t returned to Sikkim since. Then there was Elisa-Maria, daughter of a Belgian father and German mother who left her Scottish husband in Burma and married Kazi Lhendup Dori in Delhi in 1957. The two couldn’t have been more different. Elisa-Maria wanted to be Sikkim’s First Lady, but Hope Cook stood in the way. “She didn’t just want to be the wife of an Indian Chief Minister; she wanted to be the wife of the prime minister of an independent Sikkim.” With that kind of an ambition, it was not surprising that with annexation, neither Hope nor Elisa-Maria got what they wanted. Meanwhile, in New Delhi Indira Gandhi was going from strength to strength, and India was flexing its muscles. The 1971 Bangladesh war and the atomic test in 1974 gave Delhi the confidence to take care of Sikkim once and for all. Indira Gandhi was concerned that Sikkim may show independent tendencies and become a UN member like Bhutan did in 1971, and she also didn’t take kindly the three Himalayan kingdoms, Bhutan, Sikkim and Nepal, getting too cosy with each other. When the Indian troops moved in there was general jubilation on the streets of Gangtok. It was in fact in faraway Kathmandu that there were reverberations. Beijing expressed grave concern. But in the absence of popular protests against the Indian move, there was only later that there were contrary opinions within India- (Formed Indian Prime Minister) Morarji Desai said in 1978 that the merger was a mistake. Even Sikkimese political leaders who fought for the merger said it was a blunder and worked to roll it back. But by then, it was already too late. Lhendup Dorji became the first chief minister of the Indian state of Sikkim and retained the post until 1979. The Indian government conferred on him ‘Padma Bhusan’ in 2002 and he was also awarded ‘Sikkim Ratna’ by the state government in 2004. Despite such “rewards,” Lhendup and his wife Elisa spent their years in Kalimpong repenting their past deeds. After the death of his wife in 1990, Lhendup was forced to lead a solitary life. He neither had any children nor relatives to take care of him. He cut himself off from his own people to avoid their wrath and hatred. In the elections held in 1979, Lhendup’s SNC failed to bad even a single seat in the Sikkim’s legislature. This effectively brought to an end to his political career. At one time, when he had gone to file his nomination, his name was missing from the electoral roll. In his resolve to dehthrone the Chogyal Dynasty that had 400-year-old history in Sikkim, Lhendup ended up delivering his motherland into the lap of India. In return, all he got was a life haunted from the shadow of the past and of ignominious death. The Indian annexation of Sikkim is illegal and the Kingdom should be re-established. There is something to say about India, the world’s largest democracy. India is an expansionist in the classicist sense. India’s territory has been expanding ever since her independence in August 1947. First India expanded into Kashmir, sending troops into Kashmir literally days after her independence. Despite there is an United Nation resolution calling for Kashmir to have a plebiscite which India never agree to participate. Then in 1951, India expanded into Tibetan territories BEYOND the territories controlled by British India. But the newly independent India simply wasn’t content with what they got from their colonial master. They want more. Specifically to seize the town of Tawang, the birthplace of the Sixth Dalai Lama some three hundred years ago. India still stayed on in Tawang to this day, with a heavy troops presence of over 100,000 strong. In a heroic attempt to resist the occupier, the local Tibetans decided to take matters into their own hand. Then in 1961 India expanded into Goa, a Portuguese colony that explicitly refused to join the Indian Union in 1947. The United States’ official reaction to the invasion of Goa was delivered by Adlai Stevenson in the UN Security Council, where he condemned the armed action of the Indian government and demanded that all Indian forces be unconditionally withdrawn from Goan soil. These two are my father’s parents and this is all back to front. Elisa Maria was the daughter of a Scottish father and a half-English, half-Irish mother, and her husband was half Southern Irish and half Burmese. She just told journalists she was Belgian because she had a strange sense of humour and liked to mess with their minds. False. UN Security Council Resolution 47 says “Noting with satisfaction that both India and Pakistan desire that the question of the accession of Jammu and Kashmir to India or Pakistan would be decided through the democratic method of a free and impartial plebiscite” meaning that it acknowledges that both sides want to settle the issue via plebiscite. However, as the resolution states, a plebiscite cannot be conducted until BOTH India and Pakistan withdraw from the portions of Kashmir controlled by them. Also, since the Indo Chinese War of 1962, China controls the Aksai Chin region of the state, which must also be taken into consideration. Also, as a result of the ethnic cleansing of the Kashmiri Pandits from the state, as well as the continued cross border terrorism and insurgency backed by the ISI, there is too much demographic change, extremism, and hate in the state for a plebiscite to be fairly held. In any case, the UN Resolution was passed under Chapter VI of the UN Charter, making it non binding. That’s why the resolution specifically uses the word “recommends”; it can’t order anyone to do anything. Further, India invaded the state of Kashmir at the behest of the King of the state after he signed the Instrument of Accession that all other Princely States that acceded to India signed. Alastair Lamb asserts that the Accession was not yet signed when the Indian army invaded, but that makes little difference to the situation, as the king had come to meet with Indian diplomats specifically to accede to India so that India could save the kingdom from Pakistan. So even if India was indeed invading another country, they were doing it at the urging of its king, and to drive out Pakistani invaders. This is, at worst, a legal technicality, and hardly the imperialism you make it out to be. Tibet may have asked India to return the territory that the British took, but India was under no obligation to hand it over. It is important to note that Ladakh became an independent kingdom after the Tibetan Empire broke up, under the Namegyal dynasty, though it was eventually taken over by the King of Jammu and Kashmir, who acceded to India. So Tibet lost its claim to the area. Incidentally, the people of Ladakh are not protesting against Indian rule; they have democracy under India and like being part of it, especially seeing as the Communist Chinese dictatorship is close by. As far as Sikkim is concerned, it became a British protectorate in 1890, after the British repulsed a Tibetan invasion. So Tibet renounced its claim to Sikkim in the peace treaty. Tawang, though originally under the control of the Mon people, became part of British India as a result of the Simla Agreement, so Tibet renounced its claim there too. Tibet may have complained that Tawang did not belong to India, but did it really belong to Tibet given that the Mon people originally ruled there, and that Tibet had given it up to the British? And doesn’t the fact that the people of Arunachal Pradesh regularly vote in Indian elections and openly reject the claim of the Chinese dictatorship over Arunachal Pradesh indicate that they like being part of India? In fact, Ranjit Singh, the first ruler of the Sikh Empire, took over part of Tibet during his conquests. Would you consider it okay for India to demand this territory on that basis, given that you’re endorsing Tibet’s similar claim against India? Where do you draw the line? Goa was chafing under Portuguese imperialism just as much as India was chafing under British imperialism, and had just as much of a right to be free as the latter did. If the Indian independence movement was not imperialist, how could securing the independence of Goa be? In fact, India asked Portugal to hand over Goa several times but the Portuguese refused. India was liberating Goa, so this is, again, hardly the imperialism you say it is. Adlai Stevenson may have whined about India’s invasion but what of it? Stevenson’s own country, the US, had made Hawaii a state in 1959 (just two years before India’s takeover of Goa) after overthrowing the monarchy in 1893 and making it a territory of the US in 1898. One might argue saying that the Hawaiians wanted to be part of the US, but surely the same could be said of Goa, since the people of Goa welcomed the Indian army? As Clark himself points out, it was China that built a road in the Aksai Chin region. Though Clark only briefly mentions this, this was most definitely a violation of Indian sovereignty, as Aksai Chin was definitely part of Ladakh, as acceded to India by the King of Jammu and Kashmir. India may have been the aggressor, but it was in response to China treating Indian territory as if it were theirs. India’s forward policy, which involved creating some outposts north of the McMahon Line, was a response to this, given that China refused to drop its claim to Aksai Chin. Clark claims that China had a claim to Aksai Chin because of its Mongoloid, Buddhist population, and because China had built a road connecting Sianking to Tibet. The road is irrelevant; if India had built a road up there as well, would Clark change his view? Does the fact that the British built plenty of roads in India somehow make their colonization somehow legitimate? And if India built roads in Ladakh, Sikkim, and Arunachal Pradesh, would that make India’s claim somehow legitimate in your own eyes? As far as having a Mongoloid Buddhist population, recall that the rest of Ladakh, under Indian control, is also Mongoloid and Buddhist, and Ladakh, again, became independent of Tibet when the Tibetan empire collapsed. So even if we regard Clark’s viewpoint that territorial claims are based on race and religion, India’s claim is still stronger. Even if we ignore Arunachal Pradesh, India does have a significant number of Mongoloid Buddhists in its Northeast as well. As far as the McMahon Line is concerned, what is ignored here is that the Chinese accepted the McMahon line as their border with Burma, so it is hypocritical of them not to do so with India. Plus, all of this becomes moot unless you accept China’s invasion of Tibet in 1950 as being legitimate. So there was an entire political party devoted to overthrowing the king, ending feudalism, and merging with India. Not only that, but the majority Nepalese Hindus felt discriminated against by the Buddhist monarch and wanted more representation, and there was even celebration in the streets of the capital when India took over. In fact, the article doesn’t mention that there were anti monarchy protests in 1973 and a formal request for protection from India. The Chogyal himself was forced by popular protest to make Sikkim an Indian protectorate. So what exactly are you complaining about? Sure there was opposition, for example from the royalist Sikkim National Party, but why wouldn’t there be opposition from the elites who supported the king and would not want the common people to have more power and freedom? The article says that India rigged the referendum to join India, but simultaneously says that the pro India, anti monarchy Sikkim National Congress won the parliamentary elections with a resounding majority. So, again, this was not the imperialism that you say it was. There was indeed significant support for Indian annexation, enough to force pro democracy reforms, win elections, and influence common people into celebrating the Indian annexation. Given the amount of opposition to the Chogyal, I’m not surprised that India would place him under house arrest, probably to prevent his attempting to take control over Sikkim again. That’s why Sikkim is one of the most peaceful states in India; the people who live there aren’t revolting against the government, because they like India’s freedom and democracy. Why? So that the Chogyal can re institute feudalism and discrimination against Nepalis? India was part of british empire for 200 years then after that got her independence. Sikkim has been under india just for 36years.Everything keeps changing, nothing is permanent. So what if Sikkim lost her sovereignity for now, i’m hopeful that Sikkim shall rise again. With good leadership and blessings of Guru Rinpoche, Sikkimese flag shall flutter with pride in our motherland. We sikkimese should take every advantage of the benevolence of the Government of India who provides us with huge funds and develop as quickly as possible and make Sikkim self-reliant and a prosperous peaceful nation. Provided we dont forget who we really are with time. I dream of a modern and developed Sikkim, today we have western clothes, technology to serve us but all these who be meaningless if we lose our Sikkimese hearts. Our beloved Chogyal Palden Thondup Namgyal has carefuly shaped Sikkim as a model state of Asia. We are so fortunate. Long like Phayul Demazong our beloved Sikkim!